This is a dramatic, yet spookily FUN quilt! It looks much more difficult to make than it is--there are NO "Y" seams! This will make a grand addition to your Hallowe'en home! 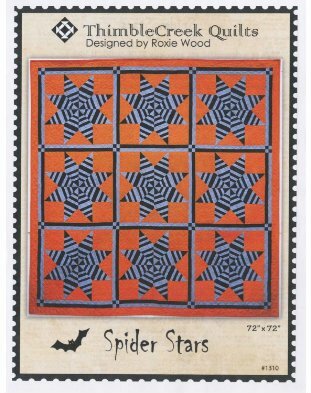 Spider Stars quilt pattern provides the contemporary quilter an opportunity to make a classic quilt pattern. Shown in a Hallowe'en holiday colors, this design could be readily adapted to any quilter's favorite colorways and would be great "scrappy"! Have FUN making this heirloom quilt!